Films have been ripe with “bromances” for years. Butch Cassidy had Sundance, Riggs had Murtaugh and even Kevin Smith had his heterosexual life partners Jay and Silent Bob. But none of those have ever been as forthcoming about it as I Love You, Man. 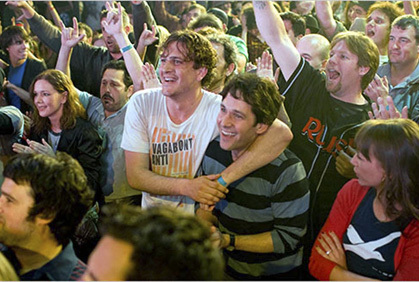 Paul Rudd is Peter Klaven, a guy who has always had more girl friends than guys. He is much more comfortable with just going to see The Devil Wears Prada and making frappuccinos for his wife and her friends then playing poker and drinking with the guys. When he proposes to Zooey (Rashida Jones of The Office), the question arises: who will be his best man? His brother Robbie (Saturday Night Live’s Andy Samberg) suggests he go on a series of man-dates to find the right guy to ask the big question to. When all hope is lost and he has not found the perfect guy to accompany him to the aisle, he meets Sydney Fife (Jason Segel from Forgetting Sarah Marshall) at an open house. Sydney is very different from Peter. He believes in being free and letting the “animal” out. The two hit it off and start to hang out, maybe a little too much. Yet as Peter and Sydney get closer, the relationship between Peter and Zooey start to strain. I Love You, Man is set up just like a typical romantic comedy, yet when it is between two guys, the result is awkwardly hilarious. Writer and director John Hamburg knows awkward after Along Came Polly and the incredibly successful Meet the Parents/Fockers films. himself, he makes simple handshakes unnatural and creates unusual nicknames. Rudd has never been quite as shaken as he is here. Segel’s Fife is the yin to Rudd’s yang. Segel usually plays the bumbling, confused guy who can’t be smooth no matter how hard he tries, but his character Fife is laidback and cool. He screams at bodybuilders when they complain to him, he goes to open houses for free food and even attempts to fight Lou Ferrigno. Rudd and Segel are true opposites, but here, they attract. The cast is filled out with comedic greats, both old and new. Jane Lynch and J.K.
Simmons as the Klaven parents show just where his weirdness comes from and there is a great collection of members from The State, with Jo Lo Truglio and Thomas Lennon as potential best men and Jamie Pressly and Jon Favreau as a married couple who flutter between love and hatred for each other. I Love You, Man focuses on a type of relationship between guys that is rarely seen on screen. Outside of the Apatow comedies like Superbad, the comedy genre is pretty devoid of these relationships. We see a great friendship starting to percolate in a believable and sweet way. It takes the tired romantic comedy clichés and revitalizes it. Near the end, you feel a connection between these two that few other comedies are able to put forth.